iii)oxygen is used as propelants in space rocket. oxidation is a process involving a loss of electron(s), Reduction is a process in which an electronagetive element loses electron while an electropositive element gains electron. faraday's second law of electrolysis states “When the same quantity of electricity is passed through different electrolytes, the masses of different ions liberated at the electrodes are directly proportional to their chemical equivalents (Equivalent weights). polymerization is any process in which relatively small molecules, called monomers, combine chemically to produce a very large chainlike or network molecule, called a polymer. dalton's law of partial pressure states that in a mixture of non-reacting gases, the total pressureexerted is equal to the sum of the partial pressuresof the individual gases. Peroxides are compounds in which there is an oxygen-oxygen bond, -O-O-. Oxygen atoms stick together in pairs to form oxygen gas, O2, and in threes to make ozone, O3, but do not form longer chains, as sulphur does so readily. 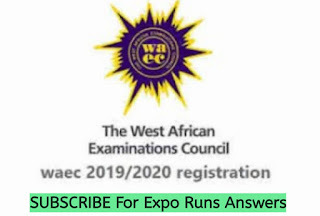 NECO Chemistry EXPO 2017 (ANSWERS).